Working with Gas Turbine Combined Cycle Power Plants. 3 great advances here! The change in power generation market over the last few years has been astounding. Market diversification has been very influential in Europe and other regional markets as feed-in prices decline and subsidization of renewable energy generation grows. Utilities and regulators have obviously been at the center of these dynamics. As expected, they are trying hard to counter the problems by increasing fuel efficiency, reducing carbon dioxide emissions and reducing fuel consumption. In the midst of all these dynamics, combined-cycle power plants (CCPP) have been very successful. Relying on H-class gas turbine technology among others, CCPPs have increased in market share and become solutions for numerous power plant projects spanning a broad range of plant configurations and applications. The future of advanced gas turbine technology in combined cycle power plants looks bright. Below is a discussion of three main advances in gas turbine technology. Turbine Inlet Air Cooling (TIAC) technology has gained immense popularity over the last few years, especially in normally hot regions. Cooling inlet air, which is the core function of TIAC systems, increases total mass flow rate, thereby enhancing power performance of a gas turbine. By cooling the inlet air the power output of the gas turbine can be boosted up to 20 % or 30 % while the efficiency is increased around 3-5%. Thanks to this good benefits combined with low capital cost turbine cooling is becoming a very popular technology for existing and new gas turbines. A gas turbine is a unit that comprise of an expansion turbine, a compressor and a combustion chamber. Compressor design is critical since thermodynamic efficiency of this unit depends on temperature and pressure drop of the air. Manufacturers can optimize compressor design such that the pressure at turbine inlet is high. We can already see this improvement in frame H Gas Turbines, specifically having around 23:1 pressure ratio. For gas turbines, higher compression ratio translates into higher efficiency. Obviously, this has an implication on the fuel gas pressure, which must now increase. There are gas compressors to help achieve these pressures. The common types include centrifugal, reciprocating and screw compressors. Another way of increasing gas turbine performance is by increasing sensible heat. This is exactly what this advance does. It can extract feed water from HSRG and direct it to a heat exchanger. With the shell side containing natural gas and the tube side containing hot feed water, natural gas temperature rises significantly. Consequently, combustion efficiency increases. The cool feed water will then recirculate back to the HRSG pre-heater condensate line. The fact that combined cycles with gas turbines are surpassing 60 % efficiency is enough evidence that a lot is happening in this field. Obviously, advances such as the ones mentioned in this post affect the design of gas turbines. Higher temperatures mean that nickel-based alloys and other tough materials must now be used to construct vanes, blades etc. You will also notice an increasing application of thermal barrier coatings (TBCs), which offer heat resistance for metals. What these advances demonstrate is that indeed, conventional gas turbines in combined cycle power plants can achieve higher efficiency and reliability. What is the emphasis in all this? It is evident that plants worldwide are striving to introduce as much flexibility as possible. Efficiency may be at the spot now, but there are other advances in gas turbine technology, some of which we have discussed. Would you like to know how you could take advantage of these state-of-the-art technologies? 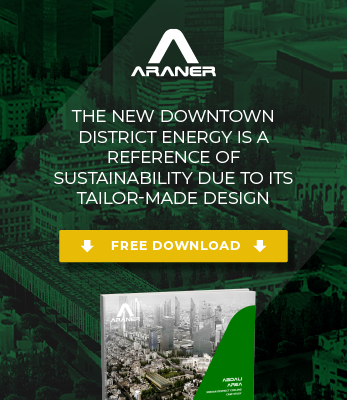 Do not hesitate to contact ARANER. If you enjoyed this post, you may be want to know what makes combined cycle power plants so efficient. on this site and I conceive that your web site is real interesting and has circles of fantastic info.